…Or, rather, David Tennant. But I will get to that in a moment. Plot devices and continuity. Like most hit television shows, in any given genre, be it comedy or drama… from Grey’s Anatomy to Ugly Betty to Lost to Star Trek to Stargate to, yes, Doctor Who. New writers must come in and draw a fine line where the old left off, and hopefully fill those new shoes properly. If you were hired to write a hit TV show tomorrow and you were not a fan or somewhat of an expert or historian in that series, somewhat part of the progression of it, I would tell you to get the F out. Good example, Desperate Housewives. I mean, come on, five years later? OK, prequels I can handle. Pip and Jane Baker; you wrote about Colin Baker but you never ever bothered to watch the series and analyze your lead character’s progressions? I have faith Stephen Moffat will make this new improved Doctor Who work to his advantage, and, most importantly, the audience’s advantage. And don’t be surprised if Russell T. Davies “guest writes” a story every now and then. Like most science fiction shows, the best writers and collaborators must look at the material of seasons past and see how they can improve on that, go one step further. They must include an element within a series that will not only keep the viewer attached but something that approximates the previous seasons and the very heart of what the show represents, especially in terms of approach and sophistication. Good example, historical stories. Anything else nowadays is a waste of time and a quick cancellation. But, once again, I have faith in the soon-arriving Fifth Series Doctor when it comes to his bow-tie donning persona, what I personally consider to be a 21st century Peter Davison by way of Jon Pertwee and perhaps a bit of suave “academic emo”. Then again, over the next three years—in which Matt Smith was contracted—I could end up wrong. However, I love the new outfit. And I fell in love with Matt Smith when I saw that new TARDIS, the tweed dandy, and the old crotchety boots and rags he was wearing. Yes, sometimes fashion makes a bold statement. The best part: it works for just about all age groups. When I was growing up, the late Tom Baker and Peter Davison years were my era. My son loves Christopher Eccleston. Who knows, maybe it’s the ears. But he is young. The way I grew up to Davison, is the way my boy will start off “fresh” with Matt Smith. The Eleventh Doctor. Below you will find set photographs littered across the web of Matt Smith in a rather torn-up outfit belonging to a dead David Tennant. Yes, the Tenth Doctor’s garb. Ice cream, anyone? And there’s a surprised Karen Gillan, in standard police uniform, by his side. So one question now remains: what happened in the aftermath of whatever it is that killed Tennant’s character off? Well, actually, two: How did David Tennant die? "Can I get you a Firerocket, Amy?" The 2010 series assures us the return of Alex Kingston (Professor Riversong, who I suspect might be Amy Pond). The new series assures us the return of the Daleks. The 2010 series rumors that Billie Piper and Christopher Eccleston will be back. How the latter, I do not know. Maybe Merlin, maybe CGI dragons. There are rumors of The Sea Devils, Sherlock Holmes, The Yeti, The London Underground (remember The Web of Fear), and possibly Noel Clarke and John Barrowman, too. But until 2010, that’s all they are: rumors. Nevertheless, I’d like to take this time to thank David Tennant, Russell T. Davies, and Julie Gardner for fulfilling a dream I had wished come true way back in the 90’s when I was scouring Forbidden Planet, Barnes & Nobles, and Borders for paperbacks like the “The New Adventures” and places like FYE and Sam Goody for VHS Tapes of past stories. 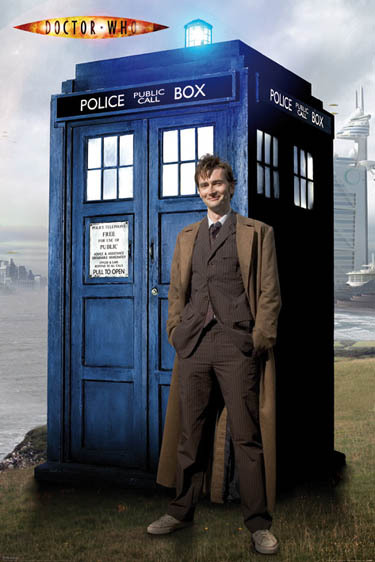 Thank you David Tennant, for being a BRILLIANT Tenth Doctor. This post is dedicated to you. P.S. : How about that new DW Logo? What do you think? P.S. 2: I’ll return with more Whovian news and thoughts in 2010. …Well, not quite yet. But the fans are really going at it (and so are the Internet forums) over WHO will be the eleventh actor — or actress — to play the role of scifi’s beloved time traveler. Stephen Moffat takes over the show come 2010 for Series Five. But the question still remains: who can fill Tennant’s shoes and do one up? Who can be a better Doctor now, since the show was revived in 2005, and keep the series going as strong and dynamic as ever before? 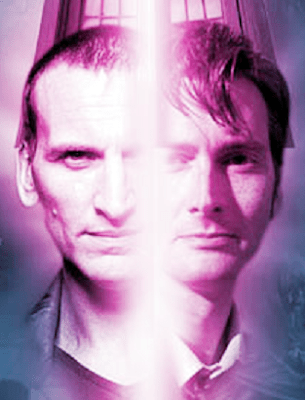 So who do you think should be the next Doctor? Better yet, who deserves to be the next Doctor Who? I’ve composed a new poll of 11 names. Eleven names for eleven possible, and rumored, Doctors. Also, I’ve added two additional choices: “None of the Above” and “Cast an Unknown”, to even things out a bit, because I realize that being a Doctor calls for a pretty big list. Please vote below! Wow, I am DEEPLY saddened. Today I heard the news that David Tennant, the actor who plays the role of science fiction’s beloved time traveler, The Doctor, is leaving the series at the end of 2009. You know, with Russell T. Davies and Julie Gardner exiting, I wasn’t at all surprised. Four years is a fantastic run in my opinion. There were some great episodes. David Tennant easily became one of my three favorite doctors since I first started watching in the early 80’s: The Tom Baker-Peter Davison era. Like classic scifi authors, NES video games, toys, and comic books, Doctor Who was just one of those childhood things which inspired me to write science fiction. I even tried my hand at a Who novel back in the 90’s around the time the license for Virgin Books expired. BAFTA and HUGO Award-winning writer, Stephen Moffat, will take over in 2010. With Moffat at the helm, I think the series will be in good hands. Darker, knowing Moffat’s work. Wait until Tennant regenerates into the 11th Doctor… Hey, don’t get me wrong, I love Harry Potter, but I hope Daniel Radcliffe hasn’t been tipped off; the boy’s only 20. He’d be too young a Time Lord. Right now a 2008 Christmas special and I believe four more specials throughout all of next year are planned.